Check out all the FIFA 13 action we have lined up for you this weekend at insomnia48 (i48) courtesy of Multiplay UK, Mad Catz and Sweetpatch TV. We will have casual 1v1 and 2v2 tournaments plus the biggest ever Multiplay 1v1 FIFA 13 Pro Cup! 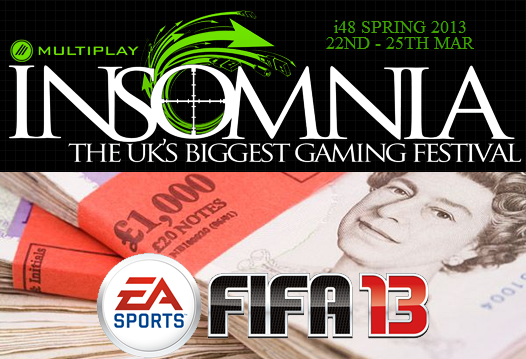 insomnia48 (i48) runs from 22nd March to 25th March 2013 at the Telford International Centre with our partners at Multiplay UK and your Sweetpatch TV team with Mad Catz will be there running all the FIFA 13 activity for you. Friday is the day to warm up and have a day of FIFA action without any pressure to win. Come and try FIFA 13 if you have not played before, get tips from the Multiplay and Sweetpatch.TV community and join in with a 1v1 and 2v2 tournament just for fun! Starts at 1pm on the Friday and runs until complete. 32 Player Cap with £100 prize fund. Starts at 4pm on the Friday and runs until complete. 32 Team Cap with £100 prize fund. RSVP here to let us know if you will be coming and we look forward to seeing you there. FIFA 13 is probably one of the most played games in the UK, and everyone knows somebody that thinks they could take on the world. Now here is your chance to prove you are the best with a prize pool that could possibly hit £2,000 with the 64 player cap! It’s not every day you can win that sort of money playing FIFA. After the huge success of the FIFA 13 1on1 tournament at previous events, Multiplay UK have made the decision to give £1,000 with, triggers increasing it from that point. That’s 5x the amount they guaranteed previously! With this comes potentially a massive £2,000 prize pool with 64 players! Check out how the Prize Find has been allocated. This tournament will now run on both Saturday and Sunday to account for the potential of extra players and also to make the schedule more relaxed for the players! Starts at 12pm on the Saturday and runs to 6pm and resumes at 10am on the Sunday and ends at 4pm. Make sure you have a TUP or BYOC Ticket for i48! Log in to Clan Forge. Select the appropriate tab for your tournament, in this case “Prize Winning”. Change the drop down box from “Not Entered” to “Entered“. Click “Save” in the bottom left. Come to the event and visit the FIFA stand before registrations close at 11:30 to check in and to get all tournament information. On Sunday we will have our usual 2v2 cup involving up to 64 pairs of players and entry into the tournament is completely FREE so you have nothing to risk and everything to gain! Starts at 5pm on the Sunday and runs until complete with a 64 Team Cap. The FIFA Masters Series (FMS) is an amazing new opportunity for FIFA gamers to compete and play in a season dedicated to their favourite FIFA game at both online and offline events. Check out all the details of its launch which will kick off at insomnia48 on 23rd March 2013. If you like the sound of these tournaments then visit the i48 tickets page and buy yours now! FIFA 13 is playable on a BYOC ticket, but only requires at least a TUP (Turn up and play) ticket to take part.